New project presented in Switzerland highlighting his collaboration with Phillip Morris and the strength of having two pilots, Dovizioso and Petrucci, who support each other. 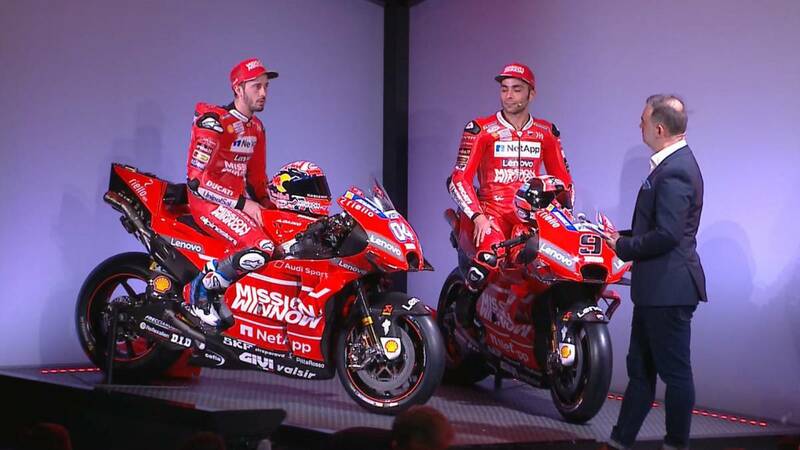 Dovizioso, Petrucci and Pirro as reserve, that is the formation presented by Ducati this year. After the departure of Lorenzo to Honda to measure his talent with Márquez for the first time with the same weapons, the team returns to be one hundred percent Italian, as in 2015 with Iannone. So, what do those of Borgo Panigale present their new project in Switzerland, so far from home? The answer to that question is the code name 'Mission Winnow'. This is how the new initiative launched by Phillip Morris, the Italian tobacco company that sponsors Ducati and which will become more visible in motorcycles and clothing, is known. the same way that happened with Ferrari at the end of last year. That is why the launching of the Bologna training took place in The CUBE, the headquarters of its partner located in Neuchatel. A unique place that with the added touch of Ducati in every corner became magical. A decent atmosphere of a leading MotoGP team that concentrated on a stage bathed in passion red, the same as Claudio Domenicali highlighted as a point of union between the whole team and the same one that looks the new GP19, a motorcycle that has renewed its exterior with almost total presence of corporate red. In addition, logos appear as the 'Mission Winnow' of its title partner or others like Audi Sport. But what will make it competitive is within ... "Improvements are everywhere and the engine will have more power", anticipated Gigi Dall'Igna, director of competition. With them they hope to "remain competitive" to do something they could not achieve in 2018: "The only problem of last year is that we could not fight for the World Cup until the end". "Our goal is the same as every year, although we are not the favorites", recognized passing the hot potato to Honda. Dovizioso and Petrucci accept the challenge of trying to win the most decorated couple on the grid. "Last year I made some mistakes that will serve as an experience, I feel better, our level will be very good from the beginning," says Andrea, to which Danilo adds: "I think Andrea and I can do a great job together, we need each other to achieve the goal. " That union is what they were looking for with both. "They are very competitive and can work together," says Paolo Ciabatti. Union ..., the one that there was not with Lorenzo?